Yes, jefbot has fashioned his room like the giant government warehouse in Raiders of the Lost Ark, not Area 51 from Kingdom of the Crystal Skull, just to be clear. And no, my room’s not as bad as what’s represented here in the strip, but it could be considered close. I’m thinking of taking pictures and posting them so you can decide whether or not I have a problem. Again, the facial expressions for this are amazing! I love JB’s expression the most in the second panel. He looks so proud, or like he’s reciting some Shakespeare. Either way, this comic made me laugh out loud. Another great one mister! now that it’s morning and i’m thinking coherently, i’d be kinda embarrassed to post those pics, Spanky. while it’s not “government warehouse” level hoarding, like i said above, it is uncomfortably close. eh, wth, i’ll post some pics later in the week. but be warned: they aint pretty. I took in the art and first thing that came to my mind was thart memorable scene from IJ Arc movie. Only then I started to read it and imagine my surprise, I guessed right. If this is even remotely what your room looks like, then you DO have a problem. Closet or anther room are allright but your own room, thats pushing it at best. As much as I love Cornfathers expresion I sincirely doubt this is the firt time he was allowed to enter this particular storage facility. Didnt he helped you move in? This is clear case of evil mastermid trying to guilt you into cleaning your place. Though usualy its parental figure of some kind who works this way… Do you feel so responsible for Jefbot Michael? HAHAHAHAHA That is probably true. Though I do wonder what other amazing and wondrous things he is hiding in there…Cure for cancer…answer to world hunger…you can never tell! Sorry, Cornfather but Jimmy is resting in Detroits goverments warehouse number 3, wooden casing, item numer GSI8144511A. Look right next to real gun with which Nixon was assasinated. That thing is put in glass display for some reason… Oh, and dont forget to get rid of your money before entering, the silver stripes on them can be traced by satelite, you know. glad the images conjured up RotLA first thing for ya since i had to change the perspective and some box configurations to make it work for the strip, Maryz. i’ll take that as a sign it worked! and while the Cornfather did help jefbot move in and knows the extent of his “collecting” tendencies somewhat, those two have been roommates for years now with bot amassing more and more stuff with every delivery from Amazon and trip to the comic store. 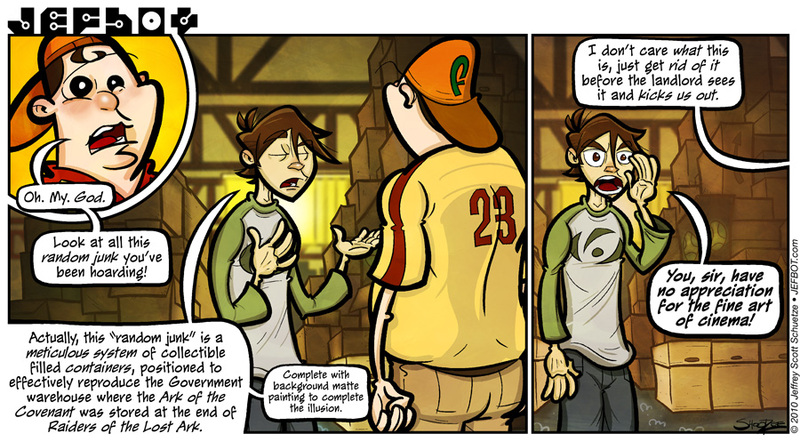 that being said, there’s enough truth in your comment to foreshadow friday’s strip. stay tuned! In addition to being technically awesome, this strip is inspiring. Now I want to organize my stuff like this! Although mine would be stacked plastic Target wheeled drawer thingies full of crafting supplies! Unfortunately, they don’t look all that Raiders storage warehouse-like. I wonder if drawers full of yarn and sequins and fabric paint and felt would be heavy enough to crush someone to death??? yes! that’s a great way of interpreting jefbot’s expression in that second panel, too, Shanna. in which case the Cornfather would FAIL that subject. heheh. you should talk to Mombot – she loves buying little plastic containers to store all her sheet music, crafts, ink stamps and other doodads, which i think might just create more clutter, actually. i might have to do a comic strip about that. heh. hopefully that kind of stuff (both yours and hers) won’t do any crushing! i haven’t seen it but i think my sister Lor has, Carl-E. that’s a SyFy show, right? worth watching? This looks exactly like your old apartment in Sherman Oaks! ha! if it works, let me know, Z. They used a matte painting in that shot? Any other illusions you’d like to shatter??? oops! sorry to ruin that bit of movie magic for ya, Timothy. won’t happen again. I have gotten my friend Eddie, the one with hot sauce, to join the fans of jefbot but he seems to be too lazy to post comments… Oh, well, Im still proud of mysef. LOL! Hilarious — the warehouse in Raiders of the Lost Ark. I’ve often dropped that in conversation to describe things in jest. In fact, if you stop by my FB page, you can see some photos that my friend Anginet took of us. Our living room currently IS our basement, as we’re having our basement finished — it looks like a disorganized version of that warehouse right now. I hope your room isn’t that bad, Jeff. thanks, man! i gotta check out those photos. and uh, no, my room doesn’t look like that. not even. okay maybe a little. just keep your eyes closed and you’ll be fine. (thick German accent) Dr. Jones, again we see there is nothing you can possess which I cannot take away. I don’t know what everyone is saying Jefbot. I with you, there is nothing wrong with collections of great items nicely organized in boxes. You are just thinking of your loved ones when you pass away. You want to be able to share all your love with them. Just think of the fun they will have going through all those boxes!!! actually, my niece is always reminding me that she’s going to inherit my hoard when i go beyond the veil. sometimes she doesn’t even try to hide the smile in her voice when she says it. Anyway, you rock as always Jefbot! I can’t believe that you continue to outdo yourself on this strip! Rock it out!!! …and make sure to leave a path from the bed to the bathroom! thanks, Funnyshaffer! yep, “sentimental” is the tricky part. my definition of the word is pretty broad when it comes to saving stuff, so i’m probably like your sister in that respect. WOW! :O sounds like an impressive collection, reynard61! a wonder you aren’t loopy from all the model cement fumes coming off those things. heheh. good luck on procuring a Yamato! Apparently you hang your lampshades in that room too… well done! That may not even be an illustration. I believe that background is an actual photograph of Jefbot’s vaults! If I had the space mine would look like an Enterprise-D cargo bay complete with transporter pad. don’t give me any ideas, CheddarMan. that sounds rad. Seen it. You have a problem. Yeah I saw the boxes and went exactly where you went before I even read the text Jeffbot. One question, where do you keep YOUR ark of the covenant? be careful what you wish for, Eptha. you might end up on an episode of Hoarders. Dude, you should see the storage unit I told you about on Twitter. Years worth of collectibles, costumes, movie prop replicas, comic books, movie magazines, role playing games, and gaming consoles collected by a pair of packrat geeks. And now, with the geekling, stuff like the swords might not see the light of day for quite some time. Bravo, BTW. RotLA was the first place my mind went, although KotCS was presumed to be the same warehouse, wasn’t it? if i post the photos of my hoard here, you readers just might have to reciprocate, Tony. it’s only fair. But if you post, I’ll post links to a smattering of the stuff we used to have around our old house in Indiana. The interview was awesome, I love behind the artist stuff like that. So is the movie you discussed a small-scale flick, or will it see a theatrical release? yeah, it’s cool having all that stuff, i just need a bigger room now, Zanter! thanks for listening to that interview and glad you dug it. i like hearing what goes on “behind the scenes,” too, so was happy to be a part of that in a podcast. i had a lot of fun and might be doing another interview toward the end of the month. d’oh! i knew i said too much, IDTMRB. Just finished reading through all the archives and loving this comic. Watched a few of the vids as well for Michael Cornacchia, nice work there dude. Keep it up looking forward to reading more to come. and i’ll let MC know you’re digging his videos. I had a blast with you on the show and did I send you an email with the Archive URL and the project Webcomics: What’s Cooking? If not, I’ll have to do that as well. Now, if Jefbot decides to move things around and he sees the Arc then I would open a few windows as he’s hallucinating. i had a great time too, KS. didn’t get that email yet, but i did put a link up to the interview in the JEFblog. and since jefbot takes after me, chances are he’s hallucinating 99% of the time anyway, so what’s a little more? I don’t know why, but your fans’ responses to this strip are crazy and as deluded as Jefbot. This is truly Jefbot’s universe.